A million people in the United States are diagnosed with skin cancer every year. For most people with skin cancer, early treatment offers an excellent prognosis. 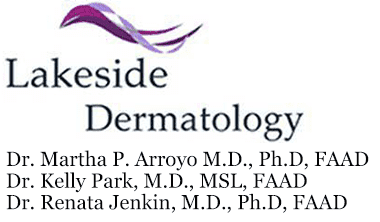 Lakeside Dermatology founder Martha Arroyo, MD, PhD, FAAD specializes in the detection and treatment of all forms of skin cancer. To schedule your comprehensive skin exam, call the Gurnee or Libertyville, Illinois, office today. Basal cell carcinoma is the most common form of skin cancer. It affects basal cells, which line the deepest layer of the skin. This type of skin cancer isn’t likely to spread, but it should still be treated as soon as possible. Around 10% of skin cancers are squamous cell carcinoma. This type of cancer affects the cells just beneath the outer lining of the skin. Squamous cell carcinoma growths vary widely in appearance, which is why it’s important for Dr. Arroyo to do a full skin exam for every patient. The rarest and most dangerous form of skin cancer is melanoma. It affects the cells that produce melanin, called melanocytes. Dr. Arroyo looks for new growth or changes in existing growths when screening for melanoma skin cancer. Early intervention is crucial to preventing the advancement of skin cancer. The Skin Cancer Foundation recommends everyone perform monthly self-checks for new or changed growths. Dr. Arroyo screens patients annually for signs of skin cancer. Dr. Arroyo may perform a biopsy of any growths or lesions she has concerns about. Lab testing confirms the presence of cancer. Depending on the type of skin cancer you have, Dr. Arroyo may order additional tests to determine how far it’s progressed. From those results, Dr. Arroyo can develop your treatment plan. In superficial skin cancer cases, she can easily remove growths. Advanced cases require complex treatment plans. Use clothing to cover your body, including wide-brimmed hats and sunglasses. Avoid the sun during the brightest time of the day: from 10 a.m. to 4 p.m.
Stay away from tanning beds; they emit cancer-causing UV rays. Dr. Arroyo can successfully treat most skin cancers with early detection. Book your full skin exam today by calling Lakeside Dermatology.